Bendy And The Ink Machine Free Ukulele Tab by Jeffrey Thomas. Learn to play this awesome video game theme music with my ukulele tab arrangement. I have the intro, first verse and ending for a great shortened version of the theme. All the chords and right hand fingerpicking suggestions are there for you. Want the full ukulele tab for free? Just send in your email address using the form provided. Looking for the best online ukulele lessons? Fill out the Schedule A Free Lesson form to set up your free online ukulele lesson today. “Bendy And The Ink Machine” is a episodic survival horror video game…whatever that means? As far as I know the version that I followed was composed by the brilliant Kyle Allen. 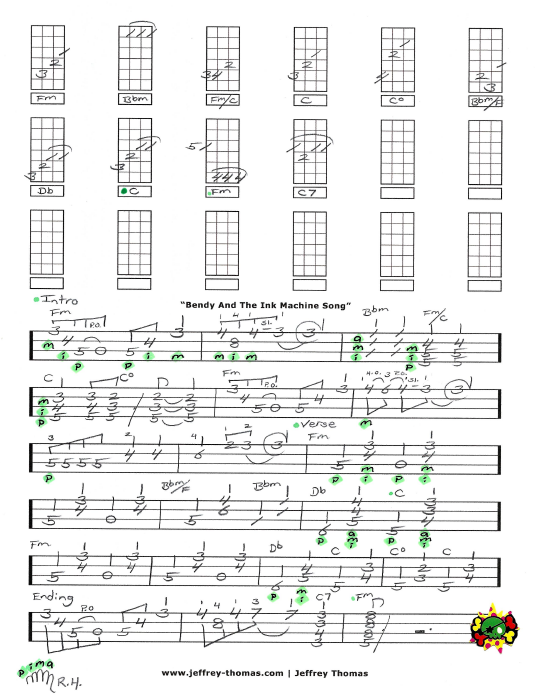 Find more cool online ukulele tab on my blog, video and tab pages.